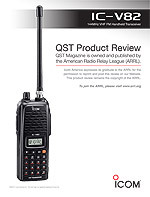 Read the QST Review of the IC-V82 here! The optional UT-118 provides D-STAR format digital voice and slow data communication. The UT-118 includes the following digital features. In the digital mode, your callsign and the receiving callsign (or CQ message) are included in each transmission. The callsign squelch allows you to choose an incoming call selected by the callsign. Also, received callsigns are automatically stored in the memory. When connected to an external GPS receiver*, position information can be exchanged with other stations. When the receiving side is connected to a PC**, position monitoring is possible. ** Position mapping software required (Not supplied by Icom ). A powerful 7W* output power provides superior transmit power. All this power is available with the supplied battery pack. Reduced power settings also allow you to adapt to the communication conditions and provide longer operating time. Up to 200 regular memory channels can be stored with a 6-character channel name, tone and duplex settings. The memory channels can be tagged with A-J bank name and allows you easy channel management. In addition, use Icom’s exclusive DMS (Dynamic Memory Scan) system to scan selected memory banks by simply adding and deleting blank links. Built-in CTCSS/DTCS tone codes provide quiet stand-by and allow you to access a closed repeater. The pocket beep alerts you when a matched tone frequency is received. The tone scan detects the tone frequency used in the receiving frequency.